Like many before him, Jason Garrett tried his hands at more than one sport before settling for football. The former football quarterback had an eventful playing career, turning out for seven NFL teams from 1989 to 2004. Since his retirement, the man from Pennsylvania has fulfilled various coaching responsibilities for the Miami Dolphins and the Dallas Cowboys, both of whom he played for. His first responsibility as a head coach came in 2010 when he replaced Wade Phillips as the head coach of the head coach of the Dallas Cowboys. Jason Calvin Garrett’s story begins in the town of Abington, Pennsylvania, on March 28, 1966, when he was born to his parents Jim Garrett and Jane Garrett. He had his grade school education at Holy Cross School located in Rumson, New Jersey. Subsequently, he attended Hunting Valley’s University School, a college preparatory school in Ohio. During his time here, he was devoted to the world of sports and athletics as evidenced by the fact that he was a basketball, baseball, and football letterman. In 1984, his senior year at University School, he played football in the quarterback and safety positions, earning himself an All-League honors recognition for his performances and contribution. Jason then moved to Princeton University where he was a starting quarterback for the freshman team and in his junior and senior year. His sophomore year was a bit of a blur on his playing record. After a stellar start to his collegiate career, he moved to Columbia University in 1985, when his father was appointed as head coach for the school’s football team. However, Jim Garrett resigned after an abysmal 0-10 record, prompting Jason’s return to Princeton University. Due to transfer rules, the former freshman starting quarterback sat out his sophomore season while he ran the scout team. He regained starting quarterback position in his junior year and went on to record a victory and a loss against his former team, Columbia University. At the end of the season, he was given the Asa S. Bushnell Cup in recognition of his status as the Ivy League Player of the Year. Jason graduated in 1989 with a degree in history and a slew of enviable collegiate football records, including an Ivy League college career-high pass completion rate of 66.5 percent (366 out of 550) for 4274 yards, and 20 touchdowns. Post Princeton, Jason Garrett participated in the 1989 NFL Draft but was undrafted. He was picked by the New Orleans Saints as an undrafted free agent. His time with the Saints was short as he spent the remainder of 1990 as a coaching assistant for Princeton University after he was waived by the Saints on September 3 of the same year. Garrett’s 1991 season saw him open the season for the WLAF’s San Antonio Riders as starting quarterback, however, he dislocated his right shoulder in the game. He returned after four games on the sidelines, however, this ultimately killed off his time with the team. He then had a two-month stint with Canadian Football League’s Ottawa Rough Riders from June to August 1991. Jason Garrett joined Dallas Cowboys in 1992, thanks in part to his father’s influence who at the time was part of the team’s scouting staff. After some time with the practice squad, he made enough of an impact to become the third-string quarterback. Due to the continued improvement of his game and an injury to then-starting quarterback Troy Aikman, Jason got his opportunity as a substitute against the New York Giants. His was named the starting quarterback for the next game against the Phoenix Cardinals. However, he would again be bumped down the pecking order by the new boy, Bernie Kosar. In the years that followed, Jason Garrett continued to get the occasional opportunity to prove himself due to injuries to the quarterbacks ahead of him in the roster. One of such occasions, he produced arguably the best performance of his professional career. It was on the 1994 Thanksgiving Day game against the Green Bay Packers where he played in place of the injured Rodney Peete. Jason recorded 2 touchdowns, 15 complete passes out of 26 for 311 yards to lead his trailing team to a 42-31 comeback victory. In 1995, he had a brief span of games as a starter, effectively contributing to the team’s NFC East Conference title. Jason Garrett spent eight seasons in with the Cowboys and was part of their 1993 and 1995 Super Bowl winning teams. His time with the team saw him play only 39 games, with a 56.1 percent pass completion rate, and 11 touchdowns. Garrett joined the New York Giants in 2000 and although the turned out sparingly, he stayed on their roster until 2003. Early the following year, he was signed by the Tampa Bay Buccaneers, and then the Miami Dolphins as a free agent on November 24, 2004. He called time on his playing career in the same year. Garrett’s coaching career has proven to be more successful than his time as a player. He went from quarterback to quarterback coach for the Miami Dolphins 2005-2006 season under head coach Nick Saban. Moving on from the Dolphins, he joined another of his former teams, Dallas Cowboys as offensive coordinator. His impact saw the team’s offensive play improve rapidly as they ended the season as the 2nd best offense in the NFL. Garrett immediately became an appealing coaching prospect and was approached by the likes of the Baltimore Ravens and the Atlanta Falcons. He eventually decided in favor of continuing his work in Dallas. Over the years, he continued to receive offers from franchises like the Detroit Lions, the Denver Broncos, and St. Louis Rams. On November 8, 2010, Jason became interim head coach of the Dallas Cowboys after the team’s management parted ways with head coach Wade Phillips. He immediately turned around the former coach’s dreadful 1-7 start to the season, recording vital victories against the New York Giants and Detroit Lions. Jason Garrett was officially named the team’s head coach on January 6, 2011. In his first three seasons, he contested for the division title and a part in the playoffs. However, he failed to do so on all three occasions, as he lost the last game of each of those seasons. He finally bagged his first title as head coach when the Cowboys won the 2014 NFC East Conference title. In January 2015, Garrett put pen to paper on a $30 million contract that would keep him on for five more years as head coach of the Cowboys. The 2015 season was a poor one by their own standards, thanks in part to injuries sustained by their star quarterback Tony Romo. However, they bounced back the following season, giving Jason Garrett his best coaching record yet with a 13-3 season record and the top NFC spot in the playoffs. At the end of the season, Jason, who was now the second longest-serving head coach in the franchise’s history was named 2016 NFL Coach of the Year. 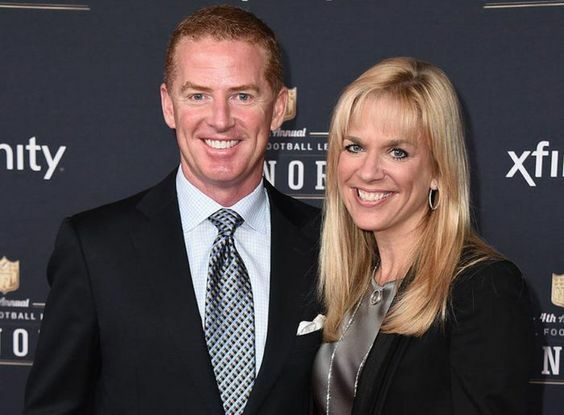 The Dallas Cowboys head honcho comes from a large family. He has seven siblings from his parents Jim and Jane Garrett. Jason comes from a family with a love for sports. His father Jim was a linebacker, fullback and running back during his playing days. Jim, who also played for the New York Giants in the 1950s found more success as a coach, especially in his two consecutive undefeated seasons (1961 and 1962) as head coach of Susquehanna University. He also had successful spells when he worked with the New York Giants, New Orleans Saints, and the Cleveland Browns as an assistant coach. He was part of the scouting department of the Dallas Cowboys from 1987 to 2004. Jim passed away on February 9, 2018, in the presence of his wife and all eight of his children. Jason and his two brother’s John and Judd followed in their father’s footsteps, playing and subsequently coaching in the NFL. The three brothers were all on the roster of Columbia University’s and then Princeton’s football team at the same time. As of 2018, Judd operates as a front office executive with the Dallas Cowboys, while John holds head coaching responsibility at Lafayette College. Jason also has another brother, Jim Garrett III who is an English teacher. He also formerly coached football at Hunting Valley’s University School. Jason has been married to his wife Brill Aldridge Garrett since 1994. They both attended Princeton University, however, Brill graduated a year before Jason in 1988. While she moved on to Harvard Law, Jason pursued his own dreams on the gridiron. The couple finally tied the knot in 1994, during Jason’s time with the Miami Dolphins. The couple’s union has not produced any kids. Garrett’s many years as head coach of the Cowboys is proof of his tight relationship with Jerry Jones. Jones is a successful American businessman who also played high school and college football. He is known mostly for his ownership of the Dallas Cowboys. Jones, who bought the got his hands on the Cowboys in 1989 for $140 million brought on Jason Garrett as head coach in 2011 and has developed a strong bond with him ever since. Jones has always thrown his weight behind Garrett in good and bad times, especially after a terrible 2017 season that started with high expectations. As fans and critics called for Jason’s head, Jerry gave his vote of confidence to the coach and retained him for the 2018 season.